This is the picture that launched a thousand ships for the elements who shouted their intention of fighting till the vivisection of the Indian state (Bharat tere tukde honge, etc) from the very heart of Bharat, from the campus of the elite Jawaharlal Nehru University, fully residential and fully funded by public money. It is famous for mass producing intellectuals. Now we all know intellectuals are clever people and they often use words as weapons with more effectiveness than normal weapons. It is also said that a picture is worth a thousand words, which makes it even more powerful than the words. Fortunately for the elements sworn to the destruction of India, a significant section of the media, those who disseminate pictures, and moving images, and opinions, are sworn to the morality of always finding the security forces in the wrong. The picture has gone a long way in propagating this belief and has been circulated with some exuberance to become part of the anti-India folklore in Kashmir and elsewhere. Dar is no longer an ordinary man, he has become a symbol of the victimhood of the Kashmiri people, the picture a never fading frame of reference for the brutalization of our security forces. Nobody denies the reality of the picture but the picture becomes much more than a picture when torn out of its context. The eye follows the lead given by the camera and the man behind the camera controls reality, obfuscates it, and edits it to purpose. What was the background to the unseemly episode is blotted out so that from mere information it becomes a potent tool of propaganda, a clever ploy to advance a favoured narrative! Were the security men giving the fellow a free ride for the sake of fun? The fact, as gathered from sources reliable and unreliable (truth always comes in alternative versions in Kashmir), is that the army had rushed to the aid of a paramilitary section surrounded by hundreds of stone pelting, blood thirsty hoodlums. 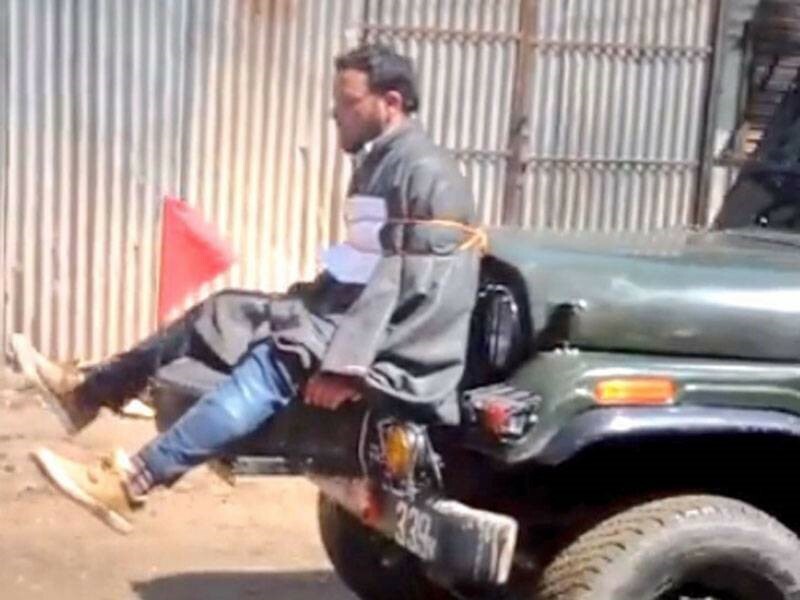 Just to debunk the romanticized version of the misguided youth, let us recall that such a crowd of ‘misguided youth’, who throw stones at the security forces by way of a normal occupation, had formed a “human shield” to obstruct the evacuation of a critically wounded Major Dahiya long enough for him to die. 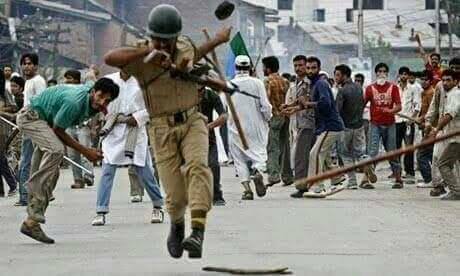 To bury the dead and to give succour to the dying is the universal norm of civilised people, but the ‘innocent misguided stone pelting’ youth advanced the design of the terrorists who had attacked the security forces by their very non-violent act. Unfortunately, the incident did not attract much attention, nor the fact that some of these elements had acted as human shield for much more sinister purpose. Coming to the point, there were three options available to the army: to be peacefully lynched, to peacefully shoot their way out killing as many as had the bad luck to come in the way of fired bullets, and the third one the "militarily incorrect’ behaviour that the army resorted to. Such an “aberration” was resorted to as a one-off tactical, disruptive measure. General Panag, who has been frequently quoted, made a very nuanced statement: he said that it was a “militarily incorrect behaviour” but hinted its roots in the absence of the “healing political touch”. The general also faulted the army on its failure to issue a statement explaining the circumstances under which it was done - a PR failure. But let us hear Lt. Gen. DS Hooda, another distinguished army officer. Consider the helplessness situation: a significant section of the civilian population has become a tactical ally of the terrorists and emboldened by the assurance of use of minimum force against civilian population (the government has withdrawn pellet gun so as not to discomfit them), comes to active assistance of terrorists during the encounters with security forces, to distract, divert and demoralize the army. They regularly resort to identifying and targeting families of pro India elements and police men and their family members. The entire democratic infra structure has disappeared, the mainstream political elements have decamped to safer environs, and the considerable body of people who are not with the secessionists, have been rendered silent by force, or out of fear, and side-lined. It is a tough military situation where the security forces are in an eyeball –to- eyeball confrontation with the terrorists from both sides of border aided by a fair number of their over ground supporters. The logic of the military situation should prevail yet the army tries to act according to norms of humane behaviour satisfying all the requirements of human rights protection but when they fail to live up to the scrutiny of ideal norms those out to advance the agenda of "Bharat tere tukde honge" get into an overdrive. The counterfactual must also be stated. 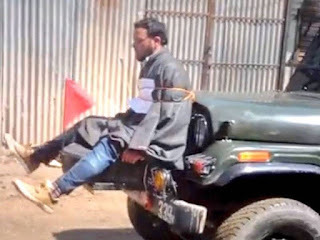 See for yourself the pictures below and compare the indignity of the two situations in your mind's eye: the one about the use of a Kashmiri as a human shield on which we have been fed to satiety, and this one which has figured just as a bit of news. There may have been a doubt about the identity of the man tied to the jeep, whether he was a mischief monger or an innocent bystander but who could have mistaken the identity of men in uniform carrying arms in the defence of the realm being kicked, humiliated, and lynched by innocent misguided youth. It did not get all the traction or anguished commentaries etc. as the former. News makes inroads in the public consciousness only if relayed in a particular manner; there are levels above which they are reduced to being endless background chatter just as the low-key positioning drowns it in distraction of other events. This is a specialized media industry. 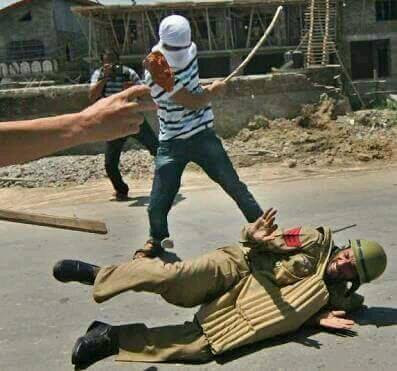 Not that those who are crying murder do not know the situation in Kashmir; they know it better than anyone else. Never was bearing arms in the defence of the realm fraught with so much ambiguity. Throughout history, victory in battle brought honour and adulation, martyrdom eternal glory and gratitude; these were the only two fates known to the soldier. But those were simpler times. Concepts of patriotism, territoriality, and nationhood had fixity of meaning; the battle fronts were defined; you were here, the enemy was there. No longer so, every thing is in a state of flux ; the enemy can be found lurking behind your lines; rooting for the vivisection of the country has become the new cool for the cosmopolitan elite yearning for a post nationalist order. Consequently, the men who bear arms in the defence of the realm find themselves trapped, at cross purposes with themselves. The situation of Kashmir valley has been well conceptuslised with administrative clarity and intellectual profundity. The problem arises from contradictions inherent in the national movement.The Mahatma had brought the diverse conflicting on to one platform without achieving their consolidation. They had been left to be reconciled in the future. This contradiction got well embedded in the Constitution. The basic contradiction is whether dar-ul-harb (the land of conflict) can be converted into dar-ul-aman within a pluralistic framework. The entire pluralistic world is gripped with this crisis. Otherwise what is there to explain the phenomenon of youth steeped in regular education taking up arms on behalf of the ISIS. Of course the original sin of Nehru referring the matter to the UNO believing that the British sense of justice and fairplay would prevail and that he would be able to win the debate with his superior Skills in English language honed at Harrow and Cambridge. After independence he created institutions like JNU where everything including anti-nationalism passed off in the garbs of liberalism. It is a place where traitors like Kanhaiya Kumar are lionised as sentinels of the liberal philosophy. It is this contradiction which has led to this situation. I spent 7 months in J&K supervising the 2002 elections. I felt that everyone had an interest in stoking the militancy to continue. Pakistan could not have had it better. 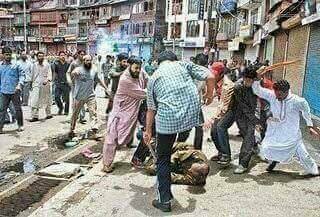 It is fighting a low grade proxy war funded by the money raised in the west in Kashmir and is bleeding the nation to submission. On international scene we are friendless. US is friend of its own interest. Russia and China stand firmly with Pakistan. Our foreign policy is weak need and vacillating. we appear to be pushed back against the wall. The issue now arises that what are we to do. In the early seventies sight of CRPF was sufficient to quell even severe disturbance. Today Army stands today where CRPF was approximately fifty years back. Army is the last line of defence. We cannot afford that we cannot afford to have army sink into ineffectiveness. All players in our power politics must realise this. The article of Mr Nath is brilliantly written with a good deal of courage. Few would have the courage to write to write as he has done. It should trigger off a theought process. Let us develop the capacity to hear the sound of clapping with o ne hand. Let us speak with one voice. Let us take courage in both hands and restore the dignity of our armed forces.